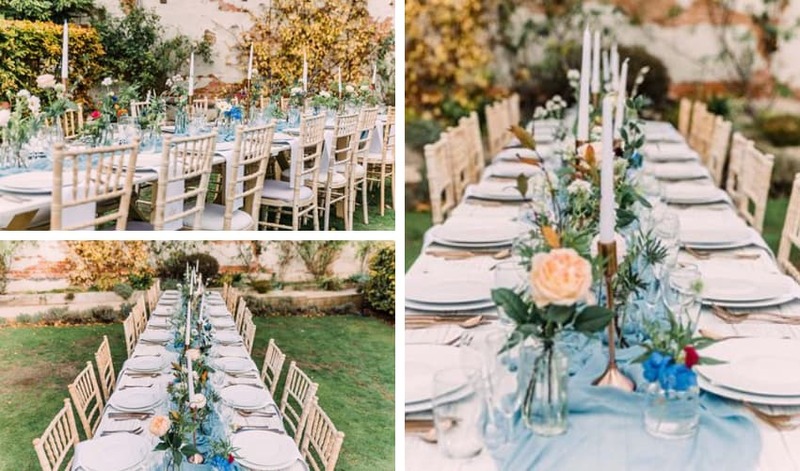 The most beautiful garden wedding set up using our distressed limewash tables and teamed with limewash Chiavari chairs. These tables are available in 6 x 2’6” and 6 x 3′ to hire. Both seat 3 people down each side and are suitable for eating – the 3′ wide gives extra room for runners and decorations. Limewash Chiavari Chairs with a wooden frame with a choice of ivory, gold, green, blue, black or red seat pads. Limewash style looking distressed trestle table measuring 6′ x 2’6″ featuring strong tongue and groove construction and sturdy folding legs which allows for easy storage. Browse our wedding furniture hire section for more inspiration.